Predominantly incomplete but brightly coloured elliptical halos over Deventer, the Netherlands on Sunday 23/4. The display occurred in two stages, the first performing one elliptic halo section (vertical radius app. 5degs) from 1030-1037 UT, the second from 1048 to 1100 UT, during some minutes including a fainter and smaller but complete inner elliptic halo (vertical radius app. 3degs). By the time shape was somewhat varying. Most striking was the coloration, with dominating red to orange but also yellow and blue outside. Sun elevations were 48.3degs at 1030, and 49.6degs at 1055UT. Typical case again. Altocumulus is never far away from ellipses. Nice one the elliptical halos I got in 2005 were all white. That's exactly the non-typical thing about this case, Michael. As far as the Altocumulus connexion mentioned by Marko, the case can be specified as typical, but the display itself seems not to have been typical, i.e. hardly colored and of constant shape. By times the ellips was fairly colored, about in the way as a nice suncave Parry arc is. Also the inner halo, which appeared during some minutes in the final stage of the event, performed good colors, oberved by myself and by my son. Additionally, some remarkable distortions happened in the initial and final stages of the display, consisting of a solitairy straight arc right below of the sun during about 1 minute, and a connecting arc between outer and inner elliptic halos (also right below of the sun) during about 1,5 minute near the final stage. Marko, Walter, what happened ? Peter, do you mean, in most elliptic halo displays the shape of the ellips is not constant? The "solitary straight arc" and the "connecting arc" are very, very intriguing indeed! Can you send me drawings of the "arcs" (in an e-mail), and, most of all: are you quite sure the strange arcs were really halo arcs? Shortly before the Deventer elliptic halo display, I observed from Rijswijk (a suburb of The Hague, 128 km WSW from Deventer)between 10.20 and 10.25 U.T. a faint part of the 22 deg.halo, a clearly visible part of the parhelic circle with a likewise clearly visible 120 deg. parhelion, in about NNE. Peter, when I called you about that display (before the elliptic display), I can remember, you told me, you saw a gap in the altocumulus, with cirrus in that gap (gap and cirrus caused by an airplane). Is it possible, there is a connextion between the gap with cirrus and the elliptic event? Peter I notuced the same thing in my elliptical halo on Dec 15th sometimes the top of the ellipse would be sharp and other times the top was rounded and unlike your is was white and like yours it was in virga and evaporated AC clouds and that particular halo lasted 15 to 20 minutes and it was one of three observed in the USA and out of all three I made two of those observations. Sometimes elliptical halos are clearly colored. Jari Piikki has phortographed one such case. One way to get distinct colors is to have big crystals, I've heard. It's the same thing with 9° halo and arcs. Mostly they are whitish, showing perhaps only reddish in addition. But in some rare cases whole color spectrum is seen. The distortions you tell are not uncommon in elliptical halo displays. It's often difficult to tell what's going on. It looks like there are no constant crystal angles. Thanks Marko, Michael and Frank. So it seems to remain precarious to speak about 'typical events', I guess. To Frank: the display was not connected to that Altocumulus gap with cirrus ('aircraft gap'); this cloud part was in a section of the sky where no halos were to expect - and not seen. What I meant in my description was a cloud pattern with longdrawn Altocumulus banks with clear zones between, in those zones some slightly structured Cirrostratus-like haziness was present. It was in this cloud type the elliptic halos were seen; no traces of the halos were seen in the Altocumulus itself or in the very small openings between the cells. The cloud pattern remained still more than one half of an hour, with no any halo presence after 10.56UT however. Only later in the afternoon, 22degs ring plus upper tangent arc became visible, in increasing dense 'real' cirrostratus. Besides the variation in radius and the distortion in shape, elliptic halos sometimes show an elliptic "glare", as observed initially in the May 13th 2005 The Hague solar display, and in the March 7th Deventer lunar display. As far as I know, there is still no good explanation for this curiosity. 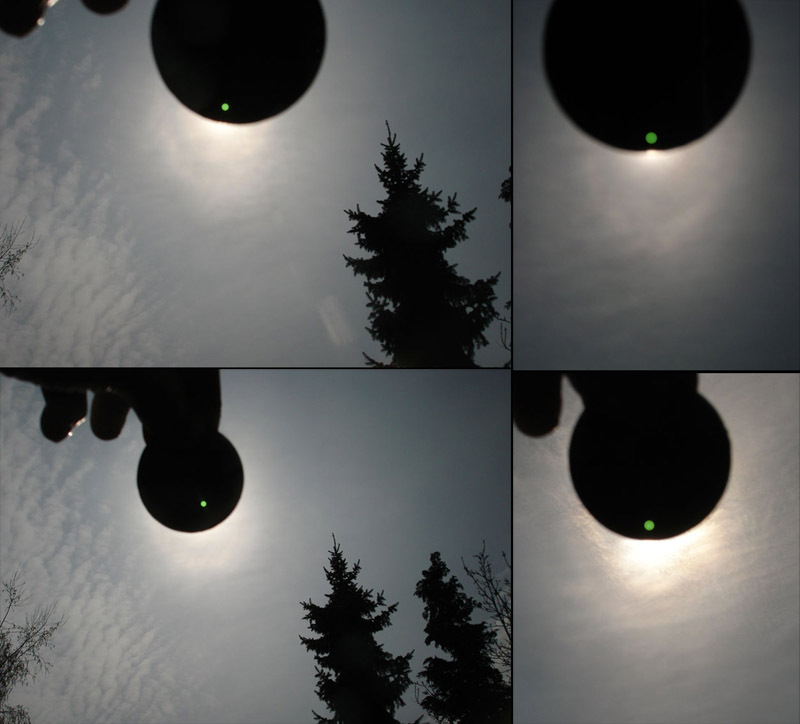 Besides the variation in radius and the distortion in shape, elliptic halos sometimes show an elliptic "glare", as observed initially in the May 13th 2005 The Hague solar display, and in the March 7th 2004 Deventer lunar display. As far as I know, there is still no good explanation for this curiosity. If the wedge angles are not constant, it's not difficult to imagine elliptical glow (which has been observed also in Finland a couple of times). Also to certain extent making the crystals less oriented adds to the glow character.